Of having to be someone. It is a strange thing to feel in exile at home, rather than at home in exile. My last real home, or closest thing to home, was Port-au-Prince. I spent nearly four mostly-consecutive years in Haiti, but a few months ago decided that I needed a breather. I wanted to be quiet and still and nowhere for a little time, to think and to write, before packing up again and either returning to the heat or moving elsewhere. Nap swiv. And so I landed in West End Toronto for the summer. The friends who have gotten used to seeing me pop in a few times a year for short visits are not quite sure what’s up now that I’m hanging around longer. They are almost startled to bump into me on the street or at parties — Oh, you’re still here? Others, who I haven’t crossed paths with in years, are confused about where I’m supposed to be. How’s New York? they inquire. When do you fly back to Paris? I blame my blog name in part. I’ve used “nowarian,” a word born of the playful genius of Caribbean English, as my username, social media moniker, and blog identity for nearly a decade. In that decade I have moved house at least 22 times (that I can recall) in five countries. This has made me very good at packing and unpacking, a master at airport security lines, more graceful with goodbyes and heartfelt with hellos, and kept me from accumulating more than I can carry. My shoulders have never been stronger, my keep-or-toss decisiveness never sharper. But lately, I’ve been complaining to friends, the word has started to feel like a burden. What if I want to accumulate things? What if I want to lay down roots? What if I don’t want to be from nowhere? After so many years away I’m a ghost in my own home town, a foreigner in my fatherland, and the last place I felt entirely in my element is a country that, even should I decide to live out the rest of my days there, will forever view me as an outsider. Adaptable Otherness, in a way, is my jam. This is how I was raised in West End Toronto, crashed up against all these other kids whose parents’ life choices and migratory options forced us to grow together, all different skin tones and hair textures and cooking spices that seeped into our bargain bin, hand-me-down, and home-made clothes. I can’t recall if we asked one another where we were from. I’m not sure we cared at that age. At lunchtime we traded leftover curries, cured meats, greens, thick soups, beans and rice, spicy roasted peppers smothered in olive oil and garlic. We taught each other how to swear in our respective native tongues, played tiny interpreters at parent-teacher meetings, and developed a collective way of speaking that incorporated our many accents. Nobody stuck out as different, because we all did. I romanticise those days, though I know I shouldn’t. The poorest kids were sometimes shunned for being too fresh-off-the-boat, frayed fabrics, faces dirty, bruised. Mr McLean choked one of the Jamaican kids up against a wall after recess. The French teacher screamed at the Mexican kids, calling them gangbangers. I still sting with the memory of the school librarian taunting me, her British accent echoing, asking if I knew how to speak English. no-wher-i-an 1. A person who is not connected with any church or who professes no religious faith. 2. [By extension] Sb who is not respectable; sb of no consequence. 3. [By further extension] [Derog] An unkempt looking knockabout; a person of no fixed abode. Yikes, I said. Dr James tried to mellow the harshness: “It’s a term that has a kind of semantic potential,” he said. “It has shades of meaning.” Shades that can shift and migrate. If a nowarian can be from nowhere — disconnected from his or her roots and surroundings — then a nowarian can be from everywhere too. At the time, I found some comfort in this. “I don’t belong here,” a friend said to me one night in Port-au-Prince before I left, as so many have on so many Port-au-Prince nights. This one was a blond American, a foreign aid worker. She hadn’t grown up questioning, in ways subtle or enormous, whether or not she belonged in her Northern California town. This discomfort was new for her, and no matter how long she stayed or the effort she made, she said morosely, she would never belong in Haiti. Of course she wouldn’t, I thought. Aloud, and naively, I wondered: why was that so awful? She looked at me, bewildered by the question. 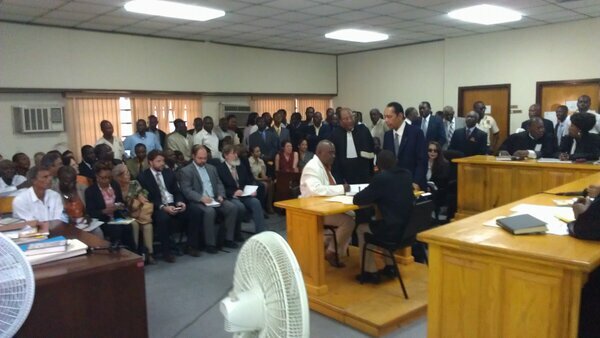 Jean-Claude Duvalier, Haiti’s former President-for-Life and son of François Duvalier, in appeals court. 28 Feb, 2013. One hot February afternoon last year I was sitting under one of the broad, white tents that was often erected on the National Palace grounds for special events — inaugurations, visits from foreign heads of state and the like — waiting for a promised interview with Haiti’s then-Foreign Affairs Minister, now Prime Minister, Laurent Lamothe. One of his aides, an omnipresent Canadian, came and sat down next to me. The aide pushed for details on what questions I wanted to ask Lamothe, stressing that there’d “only be time for one,” and asked if he could shoot video of my interview. I declined the strange request and said, vaguely, that I wanted to talk to him about the campaign to re-brand Haiti’s international image and the many challenges on that particular road. What kind of challenges, asked the aide, barely concealing his alarm. I laughed that there would be quite a number of bumps in any Haiti brand makeover. Shaking off negative stereotypes to attract investors would be tough — chief among them, the long associations with instability, inequality, and Duvalier. An investigating judge had just recently ruled not to bring human rights charges against the former President, who had returned from exile the year previous. The government aide scoffed at the D word. I didn’t get my interview that day after all. But despite repeated attempts to shove the Jean-Claude issue aside, a year later the Duvalier name is on airwaves, printed in newspaper pages and slips off people’s tongues every moment of every day in Haiti. Even the Senior Duvalier, François, has been pulled back into conversation, with sharp local reactions this past week to an adoring memorial penned by his grandson, Nicholas. In the case of Nicholas’ father, Jean-Claude, the human rights violation charges may have been dropped, but certainly not forgotten. I’ve been following the appeals process in a downtown Port-au-Prince courtroom since hearings began in late January, where alleged victims of his regime spend their Thursdays giving personal testimony of their unlawful arrests, solitary confinement, beatings and other tortures. The process is long, and few are optimistic about Haiti’s judicial system, but at least this particular piece of Haiti’s history is not being laid to rest, or rebranded, any time soon. Some of those testifying will participate in a number of memorial services tomorrow, April 26 — a day that is significant for a number of reasons. Amid the celebrations, on 26 April, a limousine was taking two of Duvalier’s children, fourteen-year-Simone and eleven-year-old Jean-Claude, to school. Two blocks from the National Palace, another car slowed down alongside the limousine. With perfect precision, three shots were fired. The driver and two Tontons Macoutes, the children’s bodyguards, slumped down dead where they sat. The assassin did not fire on the children, who scrambled out and ran into the school, unharmed. Sober reflection was not Duvalier’s strong suit. Instead, he ordered sixty-five of his officers to be shot immediately without trial. The Tontons Macoutes were unleashed. Guns cocked, they swaggered through Port-au-Prince, shooting and killing anyone whose car was the same make as the assassin’s. Hundreds of civilians disappeared that day. By nightfall, bodies littered the streets. The sharpest shot in the Haitian army had been one Lieutenant François Benoît, though he had been purged the previous week. In a blind fury, Duvalier became convinced–without evidence–that Benoît was the only man in Haiti capable of pulling off such a feat of shooting. The Macoutes went to look for Benoît. Twelve hours previously, he had escaped into the Dominican embassy. Instead, they went after his family. A squad arrived at the Benoît residence with submachine guns, and killed his father, his mother, a family friend, their servants, and their dogs, before setting fire to the house. Benoît’s baby son, Gérard, perished in his cradle.